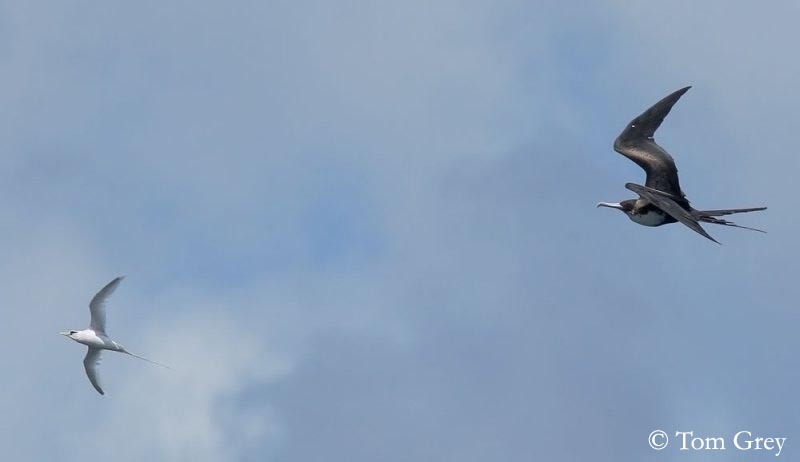 White-tailed Tropicbird is the smallest of the three Tropicbirds. It is locally called “Longtail”, referring to its long tail (about 33 to 45 cm). Adult has white plumage overall. On the upper wings, we can see a black diagonal stripe on inner wings, and black outer primaries. But the extent of black is variable. Tail is white with long central streamers. Head is white, with black eye-line, from lores to ear-coverts. Pointed bill is bright orange-yellow. Eyes are dark brown. Legs and feet are dark grey. Juvenile shows coarse black barring on the upperparts, and lacks the tail streamers. It has yellower eyes than adults. It reaches its sexual maturity at four years of age. We can find five subspecies: P.l. lepturus, fulvus, doratheae, catesbyi and ascensionis. They differ in size and extent of black on outer primaries. Phaethon lepturus fulvus has deep golden-apricot plumage, and it is endemic to Christmas. White-tailed Tropicbird is usually silent away from the breeding colony. It calls mainly when in flight. Courtship flight displays can be noisy, with strident, repeated calls. It screams loudly at nest if threatened or disturbed. Soft sounds are uttered by adults when they feed the chicks. 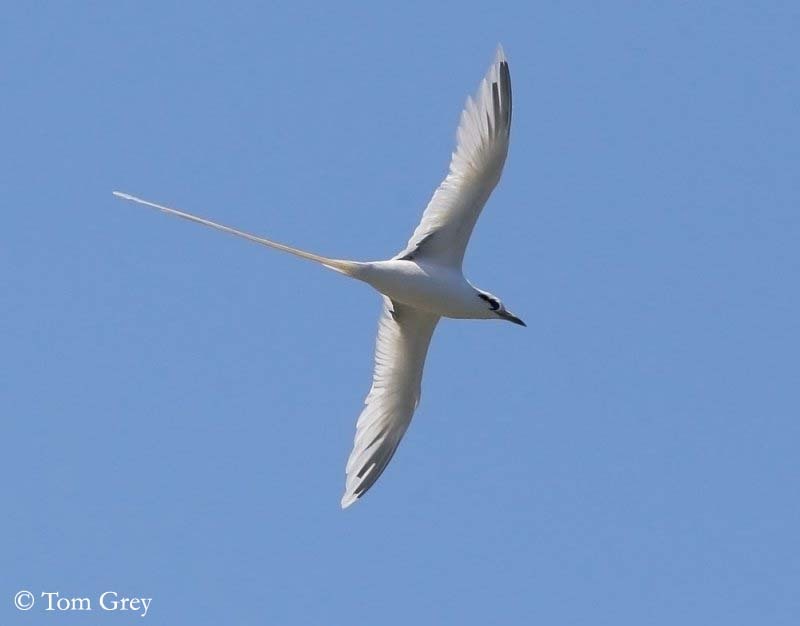 White-tailed Tropicbird is pelagic, but it may frequent the coast for food. This species breeds on small oceanic islands, on cliffs, and sometimes in fork in tree. 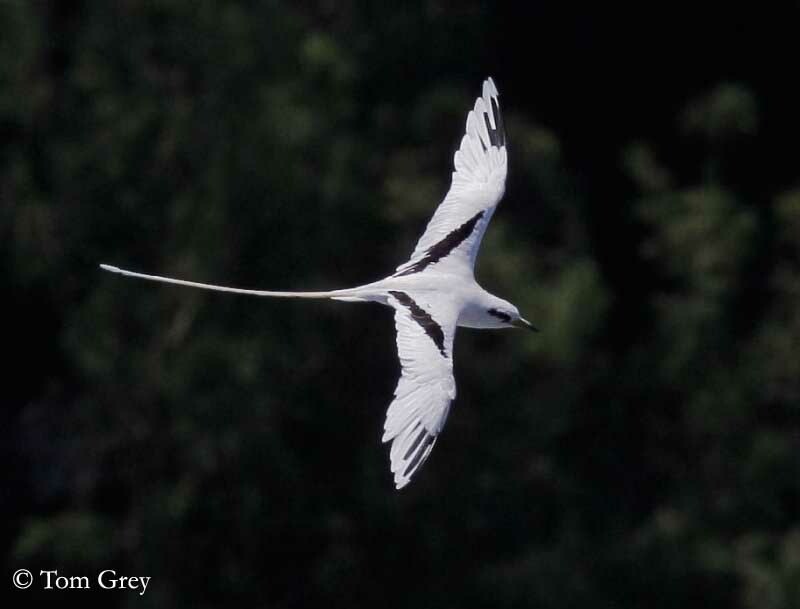 White-tailed Tropicbird occurs in Tropical Atlantic, Western Pacific and Indian Oceans. It breeds on Caribbean islands and northwards in Bermuda. White-tailed Tropicbird feeds on small fish, mainly flying fish, squid and crabs. It catches its preys by diving from height of up to 20 metres, as gannets. However, flying fish is caught in flight. It usually feeds alone or sometimes in pairs. Prey is often detected by hovering above the surface. White-tailed Tropicbird swallows it before to take off. 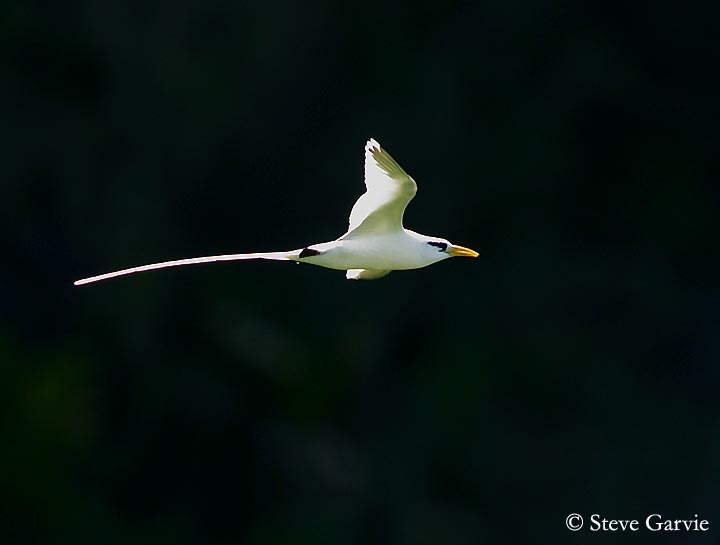 During breeding season, White-tailed Tropicbird performs beautiful flight displays. Both mates fly in parallel and perform aerobatics and synchronised figures. The streamers of the bird which is above are turned downwards, towards the other bird and can even touch it. Both birds perform shallow glides. These flights are very noisy. White-tailed Tropicbird is resident in its range. Adults and juveniles perform dispersions as much as 1000 km. The birds of the northern parts of the range are migratory. 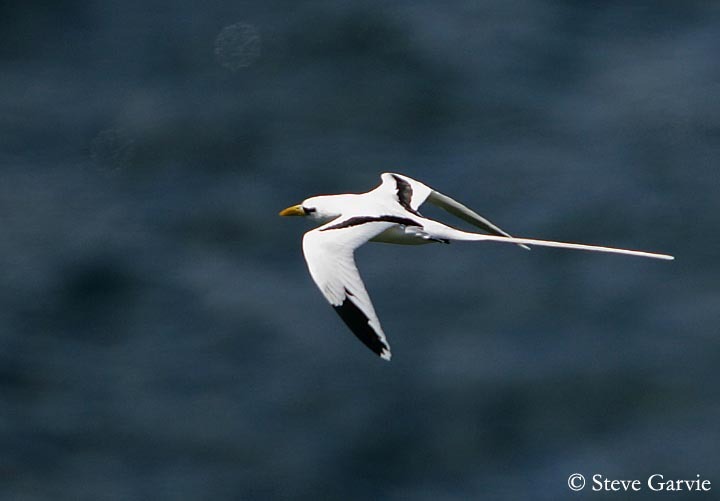 White-tailed Tropicbird performs wonderful flight displays involving aerobatics and glides. During these displays, both mates fly in zigzag, and perform downwards glides, sometimes over several hundreds of metres, with one bird above the other. Breeding season can be continuous all the year. 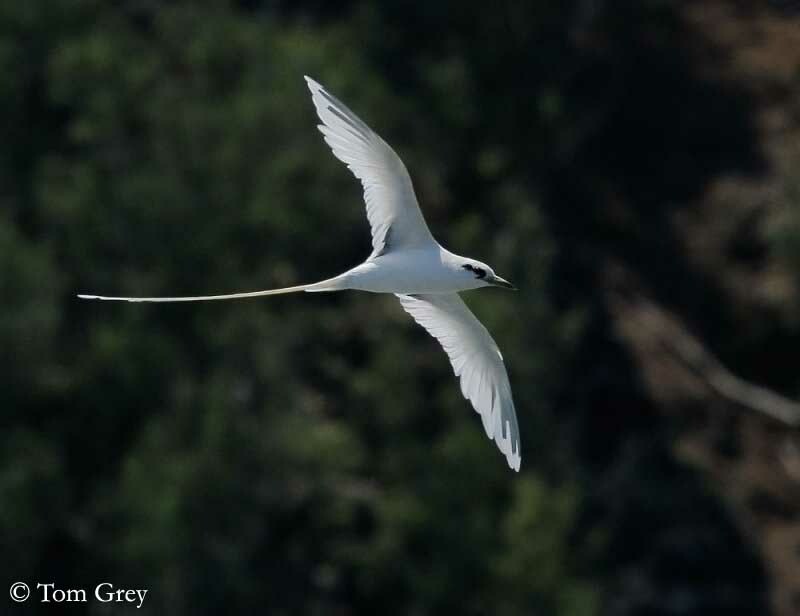 White-tailed Tropicbirds form loose colonies often in cliffs, nesting in crevices, under rocky ledges or on the ground in sheltered scrape, but also in forks in trees. Nest-site is often selected during the flight displays. Copulation occurs at nest-site, without other ritual. White-tailed Tropicbird defends strongly the nest. The owner pecks at intruder or nearby tropicbird, and their pointed bills often cause injuries on head and neck. When nesting-site is established, and nest ready, female lays a single egg, very variable in colour and markings. Incubation lasts about 40 to 42 days, shared by both parents which take turns. Chick is covered with pale down at hatching. It is continuously brooded during the first days, and then, it remains at nest waiting for adults and food. It is fed by semi-digested food. Parents regurgitate into the chick’s gullet. The young fledge about 70 to 85 days after hatching, and takes its first flight very quickly. It becomes immediately independent and performs a post-fledging dispersal. White-tailed Tropicbirds are monogamous and pairs stay together for years. They may reuse the same nest several times, because nest-sites are scarce. 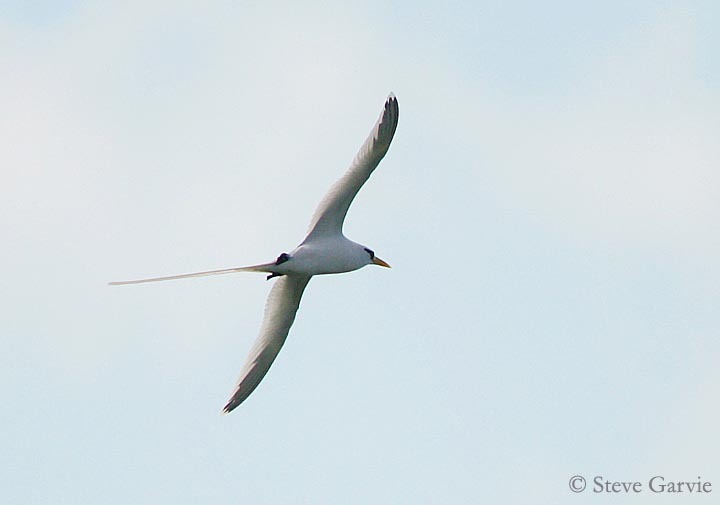 White-tailed Tropicbird feeds on small fish, mainly flying fish often caught in flight. It also takes squid and crabs. White-tailed Tropicbirds are the most numerous of tropicbirds, but some populations, such as in Christmas, have declined due to habitat loss. Main predators are introduced rats, which take the eggs and kill the birds. Human disturbances also play an important role in some declines.